I’m a new Mooney owner as of October 2017. A bit of backstory: I’ve been enthusiastic about aviation my whole life, but never had much money, so I had to content myself with a PC desktop simulation and an RC model or two. That changed when I got out of the Army in December, and started my new job in January. I started taking flying lessons right at the end of January, picked up my LSA ticket in May, and am now only separated from my Private Pilot ticket by a night cross-country and a couple more hours of simulated IFR. Which brings me to the Mooney… I did not plan to own a plane this soon. I’ve been doing research for what I would want in a plane and what my expectations should be. I got some good advice from some online communities (you may have seen my threads on the VAF and PoAforums). I eventually settled in on a short list of planes that were reputed to handle like I wanted and would meet my desires in terms of speed, economy, utility, and budget. My list ended up being narrowed down to a Piper Arrow, a Grumman AA-5, or an M20C. With those three aircraft in mind, I started doing price research so I could build a budget. While in that process, I discovered one for sale that was in apparent good condition, at the bottom end of my budget range, and only an hour’s drive away. …I had to see it. I saw it. I liked it. I test flew it. I loved it. I learned the maintenance history. I desired it. I had a pre-buy inspection done on it and that just confirmed what excellent condition this plane really was in: no sign of corrosion damage, complete logs from 1964 to present with no alarming entries, frame-off restoration completed in 2007, and a full overhaul of the engine. Overall, very well maintained. 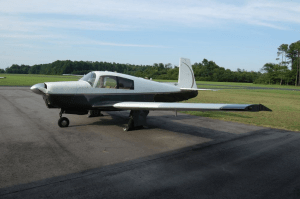 So I bought it, and have been having the time of my life working with my instructors (I got some Mooney-specific transition training from a MAPA instructor to compliment my ordinary work with my usual CFI). I’ve just about completed my sentence in Insurance Purgatory, and will be ready for my solo shortly thereafter. Weather and scheduling permitting, I intend to have my PP ticket by the new year. Then… Well, the sky’s the limit. 17,500 feet of it, anyway.